I emailed my letter of intent, stating that I want to continue in my journey of becoming a Providence Associate. The picture above is a beautiful path that can be found right outside the door of my workplace. It is the path I often take, at the end of a long day, to get to my car. I never fail to feel the stress of the day wash away as the peace of this magical place fills my heart and revives my soul. Along this path is where I have contemplated my purpose in becoming a Providence Associate. I have named it my Path of Intentions. This journey must lead me closer to Jesus. 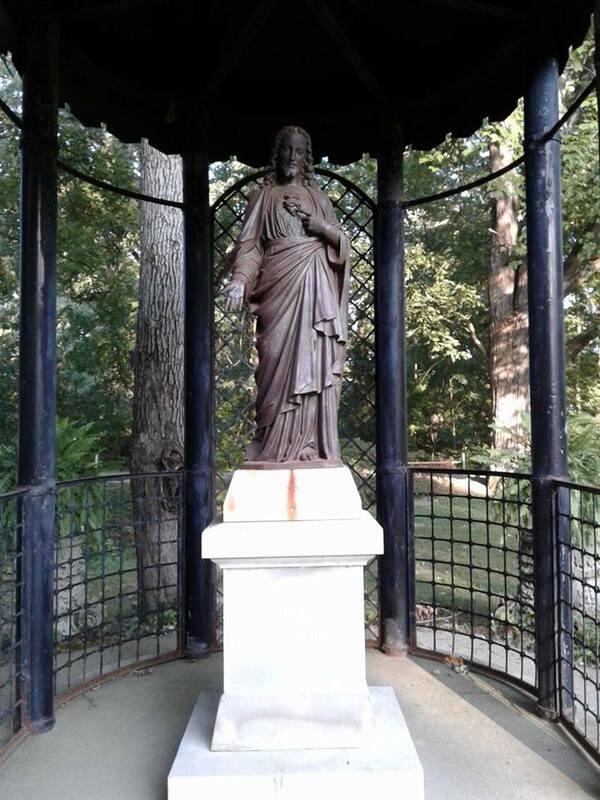 Just as this statue of my Savior is found at the end of my Path of Intentions, this journey with the Sisters of Providence must lead me closer to the Sacred Heart of Jesus. I don’t know where this journey will take me, but I am looking forward to serving the Sisters and others with love, mercy and justice. Spiritual practices, spiritual disciplines, and Christian principles are all different names for the things we do to have a relationship with God and grow in our Christian walk. We each should have those practices that we do alone and then the practices we do as a community of believers. Practices are not meant to be legalistic things that we HAVE to do to be right with God. Some of them are things that God does require, but He wants us to enjoy spending time with Him in worship and prayer. God wants us to enjoy our relationship with Him. My personal practices are: Prayer, Bible study (just started using the Lectio Divina for this), Fasting (from technology one day a week), giving as God leads, Serving as God leads, disciple-making, worshipping God in my daily life, along with a few others I practice as the Holy Spirit leads. In a corporate setting, I practice: Worship of God as creator and my Holy Father, prayer, serving, and a few others as the Holy Spirit leads. The one practice that I learned from this unit was the Lectio Divina. I had heard of this practice, but as with many Catholic practices, I assumed it was some really complicated practice that I would never be able to understand as a non-Catholic. I was amazed at how simple it was to do and what an impact it has had on my christian walk, already. The Associate handbook describes it as the “prayer of the heart.” I wanted to include a simple summary of the steps here, because I have really enjoyed the practice in my private devotional time. Step 1: Reading: Take a simple passage from your daily reading that really spoke to you. Just a verse or two that you want to delve into further. What is the context of the passages you have chosen? What is going on in these passages? Step 2: Meditation: Take the time to meditate on the passage. What is God saying to you through the passage? Is God trying to reveal something to you in this passage? Is God telling you to implement a part of the passage into your everyday life? How will you do that? Step 3: Prayer: Pray about what the passage is saying to you. Talk to God about any emotions you may feel about the passage or what you are feeling led to do. Don’t hold anything back. Tell God everything that is on your heart. Step 4: Action: What action do you need to take? How is the Holy Spirit leading you to act on the passage you have read? I encourage you to research the Lectio Divina for yourself and see if it is a practice you want to implement in your life. There are many books and websites on spiritual practices. I challenge you to do some research and see which practices God is leading you to implement in your daily life. Remember: practices are not supposed to be legalistic, but a way to enjoy our relationship with God. If a practice becomes forced, then something is not right and you need to pray for a solution. I have changed my prayer practices many times. I want my prayer life to be a way for me to connect deeply with God. When I feel that something is being forced, I change it. The two main practices that ALL christians should put into practice are prayer and Bible study. If you are a new Christian then focus on these two practices for now. The main thing is to enjoy your relationship with God. Finding ways to connect on a deeper level to the ONE who created us. If you need guidance or prayer, I am just an email away. Be blessed, my friends! 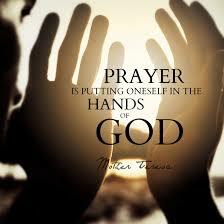 I have been contemplating the role of prayer in my life. What is prayer and why is it so important to our christian walk? What draws me into prayer? A need and a wanting to be closer to God. I want to share every moment of my day with my heavenly Father and I want to hear what He has to say. My desire is to be in continual prayer throughout the day, so I am always near to God and prepared for whatever may happen, be it good or bad. My desire is to abide deeply with God, with Jesus and with the Holy Spirit. I want to have the same relationship with God that George Mueller had. God worked through George Mueller to transform the lives of thousands of orphans. God could not have used Mr. Mueller to that level without Mr. Mueller being intentional in his prayer life and his christian walk. Centering Prayer – a quiet prayer time to really hear what God is saying. The Daily Examen – An Ignatian practice to prayerfully examen the day’s activities and look for ways in which God has spoken to us or convicted us of sin. Prayer Journaling – A way to pour out our hearts to God. It is often easier to write out our prayers. Journaling is a good way to empty ourselves, letting go of everything we need God to know. Praying Scripture – Using scripture as prayers. Praying God’s Word back to Him can be effective. Holy Spirit Led Prayer – Praying as the Holy Spirit leads rather than using legalistic lists. Prayer Lists – They feel legalistic and make me feel disconnected, rather than connected. I also, want to pray as George Mueller prayed. Never making an appeal for finances etc. instead making his needs known to God and God alone and trusting in a Provident God to provide. God always met their needs. Depending on God and not man to meet our needs has to deepen our faith. Trusting God alone to meet my needs is going to push me to deeper levels in my relationship with my Provident God. I have a feeling it may push me out of my comfort zone as well. I have a feeling God is up to something and when I partner with Him in prayer, the heavens are going to break open and His abundant grace and favor are going to rain down like a Spring rain, giving life in the wilderness. I can’t wait!! !